Is there a Match to Spark this Tinder? I’m not a fan of dating websites. I prefer my relationships like I prefer my produce: organically grown. However, in this day and age of internet dating and so much conversation that takes place online and over text, I can understand how tempting it is to just throw your manifesto out there, like a boomerang, and see if it comes back with anything interesting. I am one of those people who probably ought to come with a warning label. So when I found this, by inspirational coach Jeanette LeBlanc, I nearly cried when I read it. This is for the ones who howl at the moon. This is for the ones who sing the song of the wolves. This is for those that hear and heed the call. For the wild ones. The untamable. The unashamed. This is for the truth seekers, the wisdom speakers. Those who can see. This is for those who know their want as holy. The ones who have learned to embody their own divinity and intimately know their connection to all things. This is for the ones who speak straight and clear and true. Who court the shadows and dance with the muse. Who seduce, who stake claim, who look you straight in the eye without wavering. The ones who know exactly what they are worth. This is for the ones who speak their truth and write the terms of their own existence. The ones who lay claim to the wilderness, who beg, who burn, who ache, who bleed. This is for the ones who speak incantation and trust the gut wisdom and the red-hot blood that pounds in their veins. This is for those who are called relentless. Who are labeled too much. Who are called the names they have called women like us since the beginning of time. Who are shunned who are shamed who are burned. 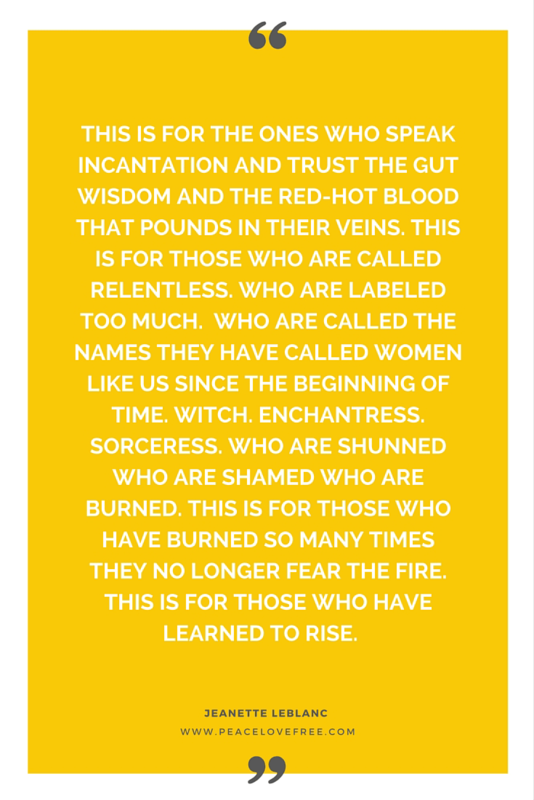 This is for those who have burned so many times they no longer fear the fire. This is for those who have learned to rise. This is for the ones who have survived. This is for the ones who, when pushed against the wall, do not cower, but run – for the mountain, for the forest, for the sea. This is for those who need freedom like most need air. For the ones whose hearts sing far off train-whistle lonely. Who crave the edge and the burn of the needle, of the knife, of the sweet hit of what tastes like craving. Who like to dance at the edge where danger lives. This is for those who honor their intuition and the ancestors and the wisdom that lives on the wind. This is for those with appetite. Those who refuse to be satisfied with less than whole. The ones with cravings that lead them to hunt and prowl and ask and know. This is for the insatiable. This is for the ones who raise their young as warriors on a path of truth. Who are tied to tribal wisdom. Who honor the pack but do not bend to its will. This is for those that hear the rhythm of the earth snare drum steady in their bones. This is for those who light the candles, who call the ancients, who speak in wild whisper under the light of the blood red hunters moon. This is for the ones who own their fierce and their bite and their hunger. This is for the seduced becoming seductress, for hunted claiming her place as hunter. For those that have fought long and hard for agency and ownership and who have refused all the rest. For those who have crossed the killing fields to get to where they are. For the ones that bring you to your knees with just a touch. For those who know their power. Who honor their truth. Who give voice to their desire. For those who cannot be contained. Who must live uncaged. Who will never be subdued. This is how I honor you. Thanks Holly! Miss you guys too! !